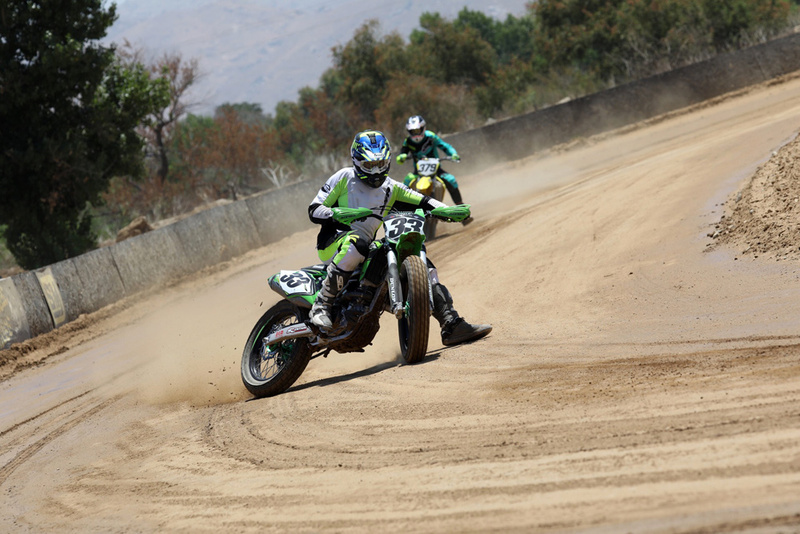 Want to go flat track racing? It’s easier than you think, and Kawasaki has built a bike to show you how. With the style of a Gumby, Rennie slowly got used to the Kawasaki. Most others would go quicker, however, and look better doing it. 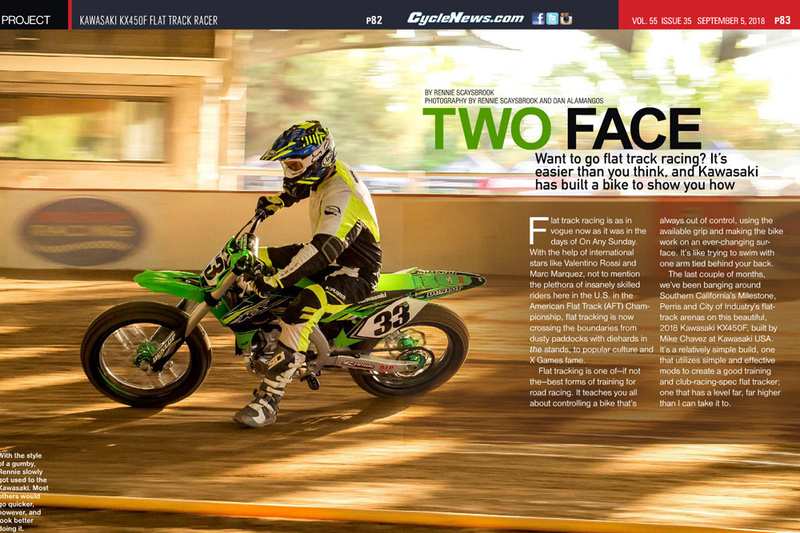 Flat track racing is as in vogue now as it was in the days of On Any Sunday. 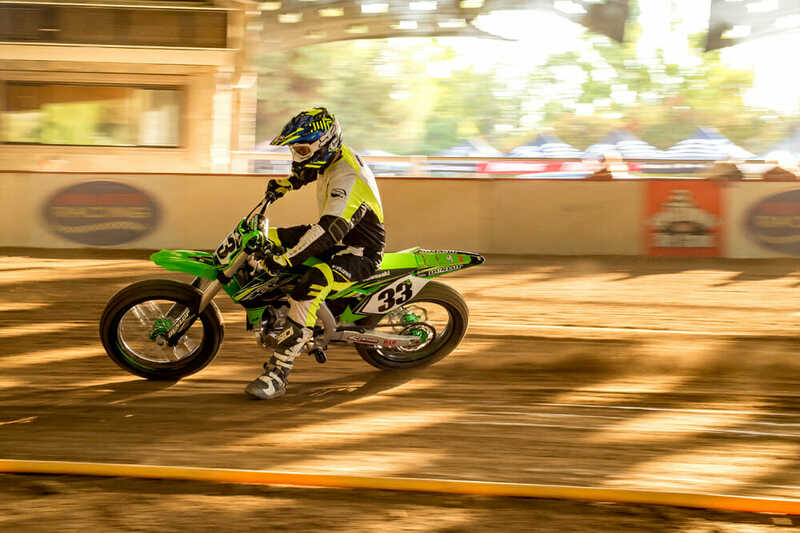 With the help of international stars like Valentino Rossi and Marc Marquez, not to mention the plethora of insanely skilled riders here in the U.S. in the American Flat Track (AFT) Championship, flat tracking is now crossing the boundaries from dusty paddocks with diehards in the stands, to popular culture and X Games fame. Flat tracking is one of—if not the—best forms of training for road racing. It teaches you all about controlling a bike that’s always out of control, using the available grip and making the bike work on an ever-changing surface. It’s like trying to swim with one arm tied behind your back. 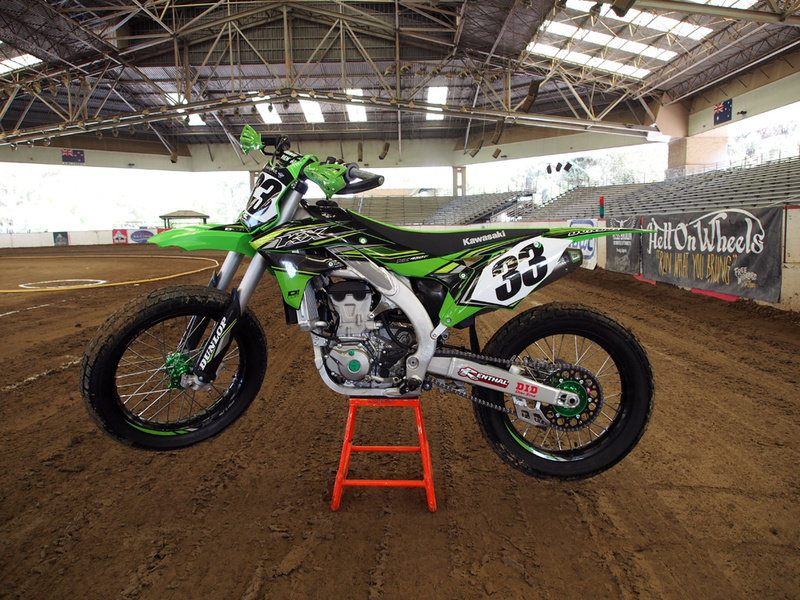 The last couple of months, we’ve been banging around Southern California’s Milestone, Perris and City of Industry’s flat-track arenas on this beautiful, 2018 Kawasaki KX450F, built by Mike Chavez at Kawasaki USA. It’s a relatively simple build, one that utilizes simple and effective mods to create a good training and club racing-spec flat tracker, one that has a level far, far higher than I can take it to. Mike Chavez build a fantastic club-level racer with this 2018 Kawasaki KX450F. 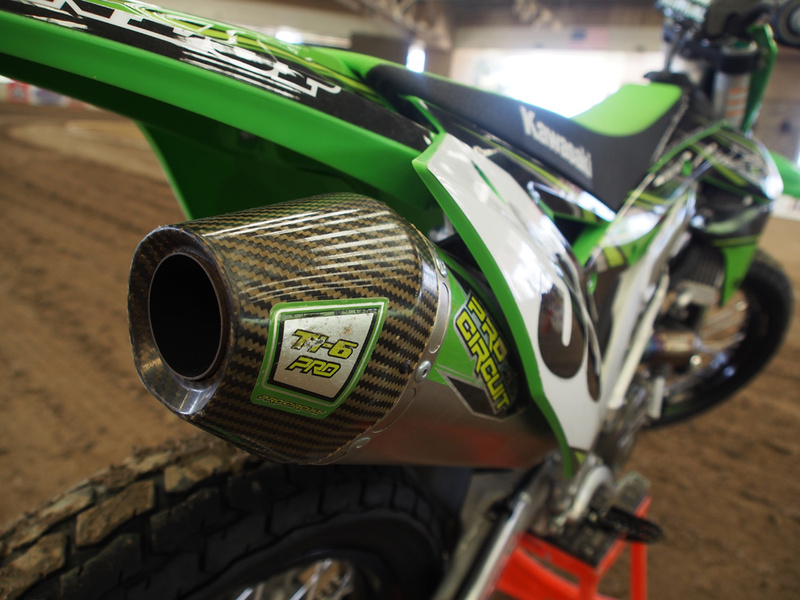 Starting off with a bone-stock Kawasaki KX450F motocrosser, Chavez pulled it all apart and fitted just the right amount of mods to make this a proper flat track weapon without going too nuts. The motor was left totally stock, as was the seat and the rear mud guard. 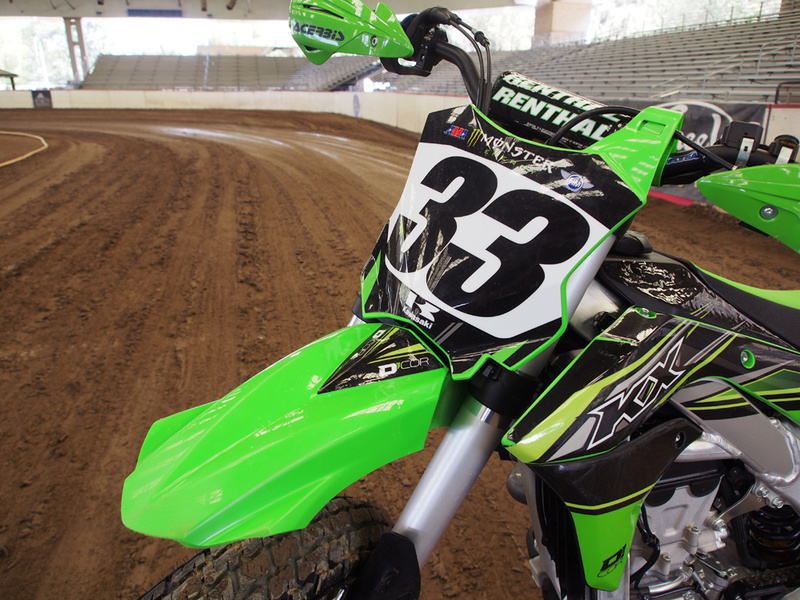 We swiped some of Josh Grant’s Supercross race numbers (really, we did!) from Kawasaki HQ. The Pro Circuit Ti-6 looking a little worse for wear after a small off. We actually stole one of Josh Grant’s race decals from the shop. Sorry, Josh! Front suspension: The stock Showa TAC air fork had damping rod spacers added to lower it about four inches from stock. We ran 167 psi for the inner chamber pressure, 16.5 psi for the outer, with the balance set at 185 psi. Rear suspension: The stock Showa shock was revalved with more low-speed compression and more high-speed rebound. A shaft spacer was added, reducing travel by 2.5 inches. The spring is a 60N/m unit and we set the sag at three inches. The Rekluse clutch gave us some issues earlier, but once sorted performed great. Front wheel and tire: The front rim is from Warp 9 Racing, assembled and trued by Racing Unlimited Kawasaki in Fort Dodge, Iowa, and wrapped in a 130/80-19 Dunlop DT3 dirt track tire. Rear wheel and tire: The rear rim is a Sun unit, again assembled and trued by Racing Unlimited Kawasaki, and wrapped in a 140/80-19 Dunlop DT3. Sprockets: Renthal supplied the sprockets with a 13 tooth front and 47 tooth rear. Backing it in is far from the fastest way around the track but at least it looks cool! Playing dirt tracker is a different thing for me. It’s pretty rare I get the chance to have a spin on a tracker these days, and even rarer to have one for more than a day. With Kawasaki building this bike for any journalist that wants it, it surprised me to know I was the only one consistently putting my hand up for it (c’mon guys!). As such, I spent the best part of two months bashing around on the 450 and I promptly learned I am not real good at this form of racing. 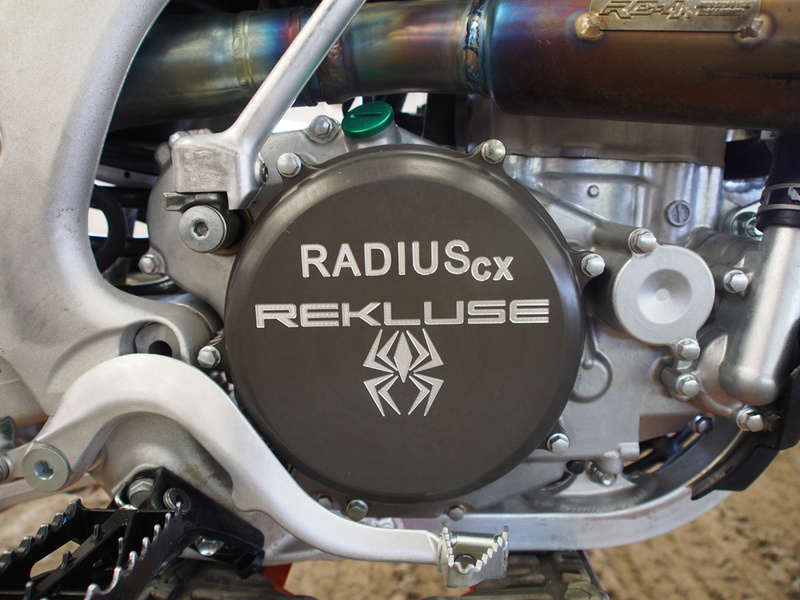 The one area I had some pretty big trouble with was the Rekluse clutch, in that it would essentially make the bike freewheel into corners when the revs were low. Just in that transition point from closed throttle and brake to open throttle, the 450 would lose all engine braking and just go in a straight line, which is far from optimal on a flat tracer when you’re trying to turn left. Beefing up the springs and raising the idle speed finally cured the issue, in time for me to get third in a club race at Perris, and from then on the Kawi and I became good friends. Chavez had the fork set absolutely perfectly for my 195-pound frame, meaning that the main thing which was going to make me faster was improving my riding, not screwing around with the bike. A 450 motocrosser, any current 450, is way more capable of turning fast laps than I am, so getting used to being smooth on the Kawasaki gas and not allowing the back to step out was always the way to go faster. It’s an old cliché in racing but slowing down actually did make me faster. Improving throttle control and making only incremental changes to body position made a massive difference to overall lap times. I was lucky enough to pick up a few pro tips from KTM Singles hot shot Dan Bromley in charging into the corners harder than I was (this is a recurring theme for all my racing! ), which helped me in a couple of club races at Perris and City of Industry. Click here for more Kawasaki motorcycle reviews and news.